As I have gotten older it's been harder and harder for me to see anything. And bending over isn't much fun either. This isn't a joke. Sawing joints has always been problematic for me and I currently wear magnifying glasses for any close work. My bench (Frank Klausz style made over 30 years ago) is the right height for just about everything except cutting dovetails. It's just too low. So I hunch over thinking "there must be a better way." About ten or so years ago I found out about Jeff Miller's Bench on Bench. I built one and it was a big step in the right direction. Basically a Bench on Bench was a little table you put on top of your main bench and it has a double vise in the front. Then along came the "Moxon Vise" popularized by Christopher Schwarz. The vise gets its name from Joseph Moxon's "Mechanick Exercises" But as I wrote last week the actual connection between the wood press illustrated in Moxon's book and how the Moxon vise is used to today is at best tenuous. Many vendors now sell complete vises or just hardware kits. We used to offer the entire vise but currently we are only offering hardware kits which we are very pleased with. Our kit came about initially from a joint project with the Philadelphia Furniture Workshop. They came up with the ears on the sides, a cambered jaw, and the little shelf for clamping tails during layout. We added acme screws, washers, big nuts that don't wear out their mortises and spin, and handles that can be moved out of the way. 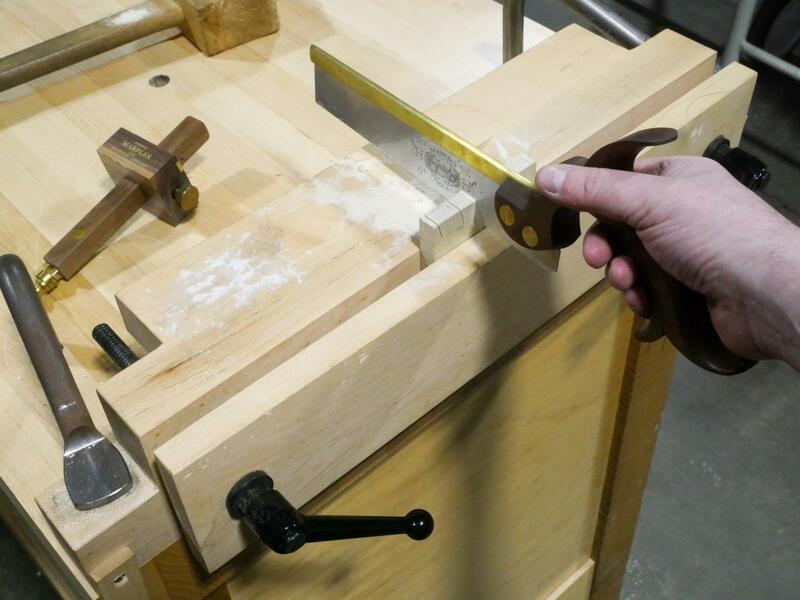 You can read all about how to design your own Moxon Vise here. The big reason the Moxon Vise made my list of ten is that I feel that by raising the overall height of where I saw I can see better, bend over less, and the whole process feels so much less jury-rigged. I am sawing better and more accurately - partially at least because I can see what I am doing , but also with the work clamped pretty low in the vise I can still easily saw uphill and have the work solid and vibration free. Not to mention my posture is better and it's less tiring. The picture above is me in the middle of sawing out tails using one of the showroom / class benches where we have fitted Moxon vises at each end. So that's my list of ten ways my work has changed. I hope to be able to say in a few years that my skills have gotten better, that I am still learning, and maybe have an even better list. Has your woodworking changed over the years too? I welcome your comments. I'm with you 100% on how we need to change our ways as the years go on. I'm pushing 70 and like you, the vision and bending over the bench got to be a bit much. Bending over was fine --- straightening up, now that's a different story. Made the Jeff Miller bench and find that on my woodworking bench it's just right for dovetails and on a slightly lower carving bench it's just right for carving. A big plus happened when I started to use a rechargeable head lamp from REI when cutting dovetail joints. Only down side is now I can't use the excuse of not being able to see! The Noden Adjustabench lets you raise the bench to cut dovetails - or do router inlay work - then lower it way below normal for heavy planing or power sanding. It is fast, reliable and generally fabulous. I built my own top, because I like a split bench, and added a tail vise on one side and a machinists vice on the other, and it can tackle any project. Moxon would have loved it. I am amazed how little press this device gets, because any woodworker that sees me using it wants one. I’m 100% with you on the Moxon vise. It’s better for doing all sorts of detailed work. Well, I'm 72 and faced the same issues but I solved them by using a low stool. Sight has been my baine the last few years. I recently got some nice "shop only" glasses that have helped. Arthritis is another challenge, but larger foam padded handles on my clamps and matts to stand on all help the joints. One of the best things is your posts Joel...honest. I really align myself to your way of thinking and working in my shop. I appreciate all the ways you help your readers sort through different challenges. I also love your tools. Thanks Joel and keep up the good work. In the newest Fine WoodWorking Magazine issue 265 - the Tools and Shops issue beginning on page 68 there is a really fine article by Christian Becksvoort titled "Working at the Right Height." Plenty of good ideas and approaches to getting your woodwork at a good working height your you. All ideas and approaches are the kind that should appeal to any wood worker who is willing to apply some skill and ingenuity to soothing the issues contributing to tired backs, sore legs, and the infirmities of us older wood workers. For me, Good light/lighting, comfortable working heights, and a comfortable stool are all musts for my workshop. Christian Becksvoort has given me an additional idea or two for further improvements. I am with you on the Moxon vise. I built mine based on a design published in TFWW with some influence from the Benchrafted design. Here is the URL http://www.jacalawoodworks.com/?page_id=230. I just can't bend over like I used to - and this is my go to device when doing any dovetail work. Here , Here another shout out for the Noden adjustable height work bench . I’ve had one for a good No. of years now and I love it’s ease of adjustability and heavy construction .I was fortunate enough to find a slightly used one locally and saved a few hundred dollars . another vote for Noden bench - i've put a moxon vise (shopmade with bench crafted hardware) on mine - it's awesome. I'm 65 and deal with all the arthritis issues and I love this bench for cutting dovetails and particularly marking the pin board from tail board. I would be glad to send you a picture.